I first saw this rapper - Privaledge in a YouTube video about a month ago, in the studio with Waka Flocka (even though the video is about a year old). And I just drew my attention straight to him and wanted to find out more, asking myself "Who is Privaledge?". Even though I still don't exactly know who Privaledge is, I can say that I do like his music. With a mixtape currently out called "Joe World" featuring some big names - Trina, Kendrick Lamar, Bun B and even Oklahoma City Thunder basketball player - Kevin Durant just to name a few. 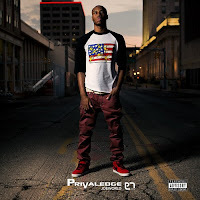 Privaledge is a talented young lad, hailing from Philadelphia but currently residing in Oklahoma City. Download his mixtape Joe World hosted by DJ Skee here. Privaledge is just a raw rapper that spits the truth - holding nothing back. With time, his bars and punchlines will get stronger. The young rapper is friends with big names in the NBA - Houston Rockets player - James Harden and Oklahoma City Thunder player - Kevin Durant, is clearly on His rise to fame. With a mixtape like this and friends like that? Of course he's going to be. Privaledge released a new video off his mixtape called "Letter To Morgan" even though "Character" is my favourite song off the mixtape, I like the sound Privaledge took in this song "Letter To Morgan". Watch why Privaledge wrote a letter to Morgan in his new video below.